Tickets for the Mayor’s Breakfast are $13 per person in advance and $15 per person at the door. Advanced tickets are on sale now, and are available at Yukon City Hall, 500 W. Main St. Recently elected officials have brought new enthusiasm to Oklahoma State Government regarding tourism. Now, Yukon will learn how to take advantage of the State’s current and future tourism efforts at the Mayor’s Breakfast. The Mayor’s Breakfast is scheduled for 7:30 am on Friday, April 26. It takes place at the Christian Life Center of Yukon’s First United Methodist Church, located at 5thand Elm. 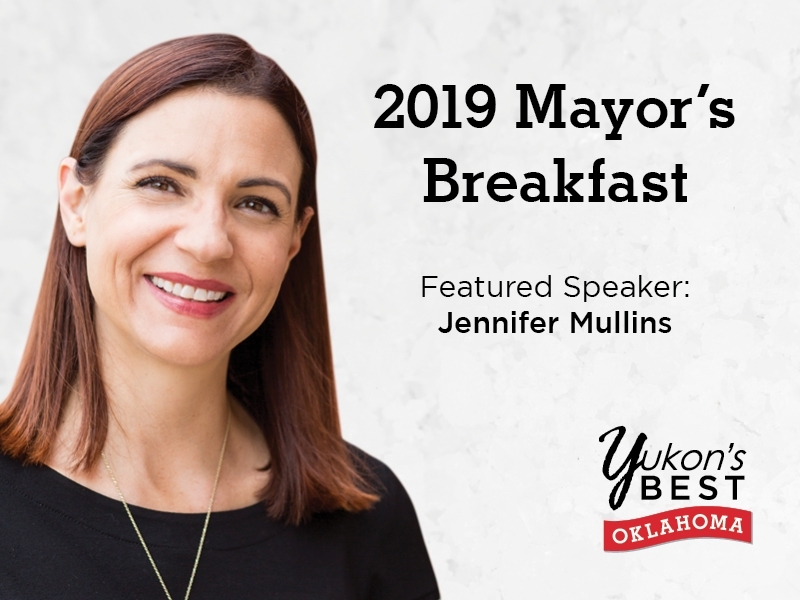 Speaker Jennifer Mullins, Director of Travel Promotion for the Oklahoma State Tourism and Recreation Department, will share the goals the State has for tourism, how this affects Yukon, and how you can make this work for your business or organization. Jennifer Mullins joined the Oklahoma Tourism and Recreation Department (OTRD) as the Director of Travel Promotion in July of 2015. The Travel Promotion Division coordinates the state’s marketing and promotions efforts with the goal of marketing all 77 counties equally and bringing out-of-state visitors to Oklahoma. Travel Promotion also includes the state’s official television show and magazine - Discover Oklahoma and Oklahoma Today, in addition to the Tourism Information Centers, production of the state tourism brochures, Consumer and Trade Marketing, International Marketing, TravelOK.com, tourism research and more. The total reach of all Travel Promotion Programs is more than 1 Billion Impressions per year! Prior to joining OTRD, Jennifer Mullins had 15 years of experience in marketing and advertising for the private sector, most recently working for Jordan Advertising where she served as Account Supervisor for the Oklahoma Tourism account and Senior Copywriter for the agency. Mullins received a B.A. in Journalism with emphasis on advertising and public relations, in addition to minors in Spanish and Theater, from the University of Oklahoma. The Mayor’s Breakfast is one of Yukon’s best events. Optimism, energy and opportunity inspire the best in everything we do. To learn more about Yukon’s best, visit www.yukonok.gov or call 405-354-1895.